The Modbury High School Pedal Prix team is a combination of parents, teachers, school personnel and students from the Modbury High community who build, test and race pedal powered 3 wheeled recumbent bikes. There are six races we can compete in with the results of five of them being able to count towards the series result. The funds we receive to run our Pedal Prix program are from school grants and fundraisers. The program has many benefits for those involved. These include fitness, learning to work as part of a team, development of realistic confidence and independence, resilience, consideration of others and the development of positive social interaction. The Pedal Prix program at Modbury High has been improving in its success over the last few years. 2016 was an eventful year for Modbury Pedal Prix. We competed in 6 races including Mt Gambier and Bussleton WA for the first time. We ran 8 bikes at 3 races this year – Four from the school and four from Fast Cats Racing. We are the biggest group involved at Pedal Prix. Our trikes had been shown to be good performers but we have spent time fine tuning to ensure all issues were covered. Rider fitness has been shown to be the main factor in performance so we emphasize this to riders and have our fitness coordinator, push them along. There are three main school teams registered to compete in the series and one developmental team. Pink Panther is our number one all girls bike; Cheetah is our number one senior secondary bike; Lynx – our junior secondary bike. When we have the numbers we also have Puma running in the shorter races to provide development, extra experience and practice for the students. The program has many benefits for those involved. These include fitness, learning to work as part of a team, development of realistic confidence, positive social interaction, independence, resilience, consideration of others and the development of leadership roles. All students have the ability to complete a SACE unit as part of the program, within the Community Studies Framework. This can be in the area of health and fitness, or another area such as the catering, event management, fundraising, bike maintenance., designing & building or lap time keeping. This is not compulsory. If your child wishes to be involved they need to see Mr Ferguson in the Design & Technology building at lunchtimes. All students involved must have parental support and there are a variety roles and considerations that need to be worked within. There have also been strategies developed to work around other commitments, like sport and work, for both parents and students. We have the added benefit of the new Pedal Prix/NEHPVSAI Workshop that has been constructed on the school grounds. This gives us possibly the best Pedal Prix facilities of any school in Australia. In 2016 Modbury High and Fast Cats Racing sent a team of five to the 6 hour race at Busselton, WA. The team included two students. They performed very well and further developed our links with Duncraig Senior High School. Duncraig supported our team well and made them feel very welcome. Then Duncraig SHS consisting of four adults and their team of nine Bush Ranger Cadets flew to Adelaide on the Thursday before Murray Bridge, picked up their trike, Phoenix and travelled to the race track. Modbury High School and Fast Cats Racing provided the tents, marquees and trailer. We also shared our kitchen facilities, food and support so they were able to compete in the 24 hour race without having to worry about all these issues. 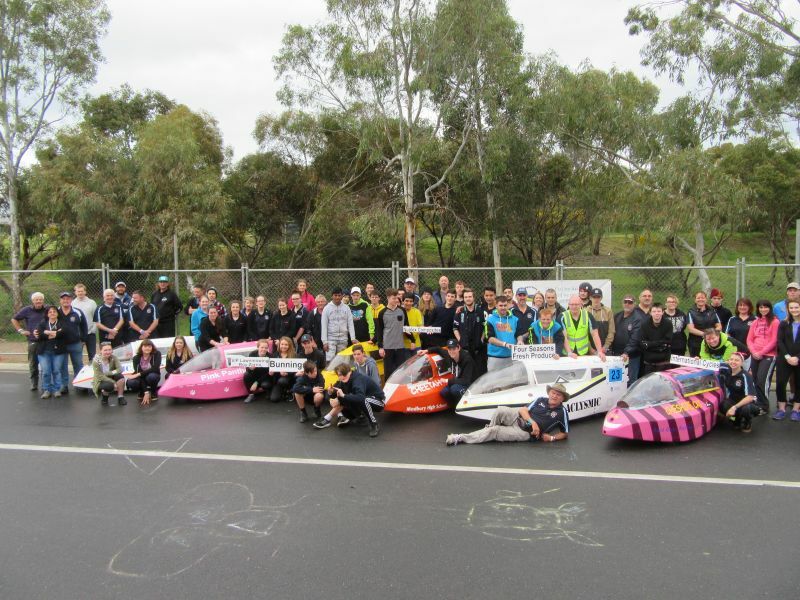 The North East Human Powered Vehicle Supporters Association Incorporated (NEHPVSAI), also called Fast Cats Racing, has supported Pedal Prix at Modbury for some time. This group of past and present parents, old scholars and interested community members provides time, expertise and funding to help the Pedal Prix Program. The Pedal Prix shed / NEHPVSAI Workshop at Modbury High has been funded and built by them. It was negotiated with the Minister of Education’s office and is covered by a Joint Use Agreement signed and sealed by the Ministers office, Modbury High School and NEHPVSAI executive members. The group members regularly go cycling together, usually on Sunday mornings as part of their drive to improve or maintain the health and fitness of the group. They do all this work without any personal gain for themselves. I wish to publicly acknowledge and thank them for their work.